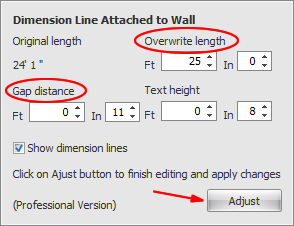 In order to adjust wall length and the dimension line gap distance from the wall (in the pro version), you first need to select the wall that contains the wall dimension line you want to update (using your Pointer tool). 2. Next, select the wall dimension line. 3. Click the Length button. 5. Click the Adjust button (to apply the changes you made to the drawing). Now, click the Pointer/Select button or click on the drawing area in order to “unselect” the wall. You can follow the same steps and adjust the gap distance between the wall and the dimension line attached to that wall and the text height. Watch this video to see how Easy Blue Print makes this easy. Note: This video has no sound; it has captions pointing out the relevant steps (program version 2.0.0.6).